If Summit rhetoric is to be taken at face value, BRICS pose an alternative, counter-hegemonic, South-South bloc in the global political economy. However, the radical critique of BRICS argues that this is simply rhetorical window dressing to further socio-economic exploitation. Academics within the BRICS Think Tank network, as well as those who buy into the idea of BRICS as an incremental balancing force against the post-Cold War unipolar system, emphasise the norm-setting, ideational potential of the BRICS. The sticking point between radicals outside and civil society forces within these spaces relates mainly to legitimation, particularly when it comes to knowledge control and co-optation of academics and activists. After all, the BRICS have notoriously authoritarian, corrupt ‘governance’ and exploitative socio-economic practices, which extend into their African deal-making and status quo multilateral assimilation. As a result of the difficulty of winning power within BRICS states, radicals normally assume that resistance from outside – what we might term ‘tree shaking’ – is a more viable way to effect change, especially as it delegitimises the power structure. But the BRICS Academic Forum and Civil BRICS act as if a Gramscian-inspired war of manoeuvre will provide gains – ‘jam making’ – through constructive engagement. The question is whether such participation necessarily involves legitimation of the processes themselves, or whether any gains (jam) are possible in terms of policy outcomes through the processes of engagement. Also referred to as people-to-people engagement, in 2015, Civil BRICS was grafted onto the state-led processes in order to deal with the BRICS Summits’ many promises to ensure ‘inclusive growth’ and ‘sustainable development.’ Navigating between rhetoric and reality, this year Civil BRICS included a process of grassroots consultations to help guide Civil BRICS recommendations to the Summit. In 2018, Civil BRICS in South Africa has been organised by Oxfam, the African Monitor and the Economic Justice Network(EJN). Funding has been provided by a German agency associated with the Social Democratic Party, the Friedrich Ebert Foundation. The National Institute of Humanities and Social Sciences has also provided limited funding. The new Foreign Minister, Lindiwe Sisulu, has emphasised the BRICS’ critical role in multilateralism and inclusive development and Sooklal waxes lyrical as to BRICS prioritisation of people to people engagement, the ‘4th Industrial Revolution’ and the developmental impact of BRICS. Yet DIRCO made no funding available to Civil BRICS in 2018, in spite of Sisulu bragging to an Independent interviewer about drawing in community activists. The diplomatic lack of interest will likely be amplified this week, by the lack of concern at the Summit about the Civil BRICS’ statement of policy asks. The Academic and Civil BRICS recommendations have been divided into categories such as Gender Equality and Inequality; the New Development Bank; Peace and Security; Inclusive Economic Development; Environment, Land and Energy; and Youth. While many of the recommendations remain vague, a few could make a difference in social justice terms to massive socio-economic inequalities and forms of discrimination that characterise BRICS governance (despite a varying degree of state commitment to democratic development). Wits School of Governance democracy expert William Gumede argues that Civil BRICS is vital for monitoring and evaluation, but overemphasises the positive role of Civil BRICS and the potential of this form of co-opted participation in a state-invited space which is controlled by (an absent) DIRCO. 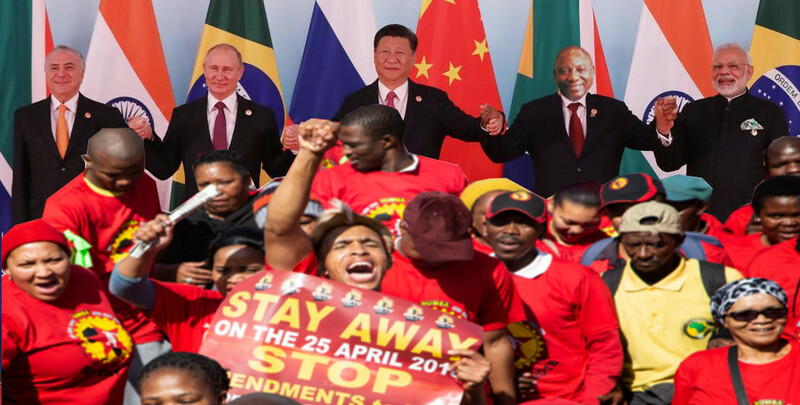 As a result, the 2018 Civil BRICS process has been criticised by the activists and social movements involved. The grassroots activists on the SA Civil BRICS steering committee have experienced the Civil BRICS space as primarily managed by the NGOs on behalf of DIRCO, leaving them unable to influence the process of agenda setting. Until recently, the grassroots activists and movements coordinated by the steering committee have adopted a ‘wait and see’ approach to the outcome of Civil BRICS even though they have found it hard to represent their communities in ways that scale up their concerns. The ‘wait and see’ approach from academics and NGOs involved in Academic and Civil BRICS process, as well as the BRICS Trade Union Forum and Youth BRICS, may not deliver results, and may instead just legitimate the BRICS governments and corporations. The question is what visible gains by insiders (jam making) will occur at the Summit meeting this week. Precedents over the last decade aren’t encouraging. Aside from the New Development Bank and a Contingent Reserve Arrangement that is merely an IMF-related bailout fund, BRICS has no other multilateral institutions with which to implement policy. Instead, BRICS representatives at the Bretton Woods Institutions and UN agencies (Security Council, trade and climate bodies) have never generated any discernible strategy, and indeed in the case of the IMF’s reform, four increased their voting shares at the expense of the poorest – South Africa – which lost 21% of its votes in 2015. It’s an old problem: whether assimilation of social movements into Civil and Youth BRICS yields anything in terms of social justice, or whether the agenda-setting Oxfam and EJN will simply help activists ‘polish the chains’ of BRICS inequality and social injustice, rather than break them. Even more scandalous, then, in view of DIRCOs low prioritisation of Civil BRICS, is that for the hosting of Civil BRICS 2018 there is no funding available from DIRCO. Perhaps it was all spent at the Sandton Convention Centre, at the Academic BRICS’ expensive summit, or perhaps people-to-people engagement is important, but not that important, for DIRCO and state diplomacy in the era of Ramaphoria. Many of the scholars and activists (including INGO activists) involved in both Academic and Civil BRICS recognise the limits to participation and critique offered by these processes. Yet the ways in which the limitations are assimilated and translated into forms of engagement and participation differ, and pragmatism is found in both optimistic and pessimistic versions. In both the Academic Forum meetings and to a some extent in the meetings held in the lead up to Civil BRICS, the rationale amongst most participating academics and activists is that a pragmatic approach, or ‘influencing from within’ is worth the somewhat stilted and officially managed debates, in order to influence policy outcomes at Summit level (jam making). Others participate to understand the limits and opportunities of the participatory space with a pragmatic pessimism: they are there to participate but do not expect much by way of outcomes because of the state controlled nature of engagement. There is also a certain amount of careerism involved, in that opportunities and perhaps even funding for BRICS research or (state controlled) activist engagement will depend on adhering to the rules of participation. An example of this pragmatism as reflected by INGOs is evident in the Oxfam 2016 publication entitled Improving Governance through Engaging with Civil Society. The report acknowledges the top down state-centric organisation of Civil BRICS in Ufa, 2015, yet concludes that “… despite these problems, the Civil BRICS process was a valuable exercise and provided a platform for civil society to discuss common experiences and formulate some initial policy positions.” The 2015 report-back in South Africa suggested mere tokenism. Ironically, or perhaps more likely illustratively, despite this foreknowledge, the types of verbal inputs from civil society speakers were still tightly circumscribed. The majority of presentations and papers were made by professional INGO and NGO staff and academics. Likewise, the Academic Forum presentations, many of which are published in a glossy coffee table edition (replete with photos and advertising) called BAR (BRICS Academic Review) reflect a similar process of what we refer to as ‘self-editing.’ This process of self-editing is seen as fairly essential to protocol and papers are screened prior to presentation through pre-Academic BRICS meetings. The forms of academic analysis and input within the Academic Forum, on display in BAR, are perfect examples of self-censorship. Similar forms of self-censorship take place in Civil BRICS in relation to what is edited out from meeting dialogues. Broadly speaking, what we refer to as academic/activist self-editing or self-censorship takes two forms. Either a deliberate denialism of the types of socio-economic interactions taking place within BRICS states with regard to trade and investment flows, and thus an active ‘buying into’ the narrative that the BRICS states seek to maintain, or a cognitive dissonance within the processes of engagement whereby academics make critical commentary and constructive inputs while not fully believing in, or committing to, the process. Due to the way Civil BRICS is managed, activist leaders have self-critiqued the legitimacy of their roles in the Civil BRICS invited space because of INGO and NGO control of agenda setting. Activists and social movements who have participated have also had to endure the professionalization of their concerns into shopping lists of recommendations that raise serious doubt as the impact of Civil BRICS on civil society. Similarly, with Academic BRICS, 22 recommendations, including the establishment of a BRICS Women’s Forum and Gender Equality Monitor will be put before Summit leaders this week. In the case of Civil BRICS, these recommendations have yet to make any visible impact on policy in multilateral terms with the possible exception of BRICS bursaries and academic exchanges which is managed and funded bilaterally. In the case of Academic BRICS, recommendations are pre-formulated by selected academics who are members of the Think Tanks together with DIRCO before the Academic BRICS Forum takes place. This puts the participatory legitimacy of the Forum at issue, as well as the integrity of those academics who believe their role is to make a difference through critical engagement. Perhaps activists and academics have already served their purpose for 2018. DIRCO’s box marked BRICS academic and civil society participation has been ticked. Whether or not the Academic BRICS academics and Civil BRICS activists are left feeling powerless supporters of a diplomatic legitimation processes, or of having made genuine change possible through Summit uptake of even two or three recommendations, remains to be seen. The final test is the Summit this week. Will it be business as usual, lots of diplomatic fanfare, followed by the recommendations in their entirety finding their way into government filing cabinets as has happened before? This Summit will determine whether Academic and Civil BRICS activists have (again) participated in a state endorsed charade of jam making, where in fact the process is virtually entirely devoid of policy content. As insiders to both processes, we have to face up to the fact that we will be endorsing state fairy tales of alternative development if our critique and input is insufficient in terms of policy gains. Bandile Mdlalose is a Durban community organiser. Lisa Thompson is professor at the University of the Western Cape.